113⁄8 × 81⁄2 in (29 × 21.5 cm) each. Inscribed on the scroll: Ecce virgo concipiet et pariet / filium et uocabitur nom(en) ei(us) emmanu / el. Ysayas . cap(itul)o vii. (“Behold, a virgin shall conceive, and bear a son, and his name shall be called Emmanuel” – Isaiah 7:14). Gianluca del Monaco, Simone di Filippo, detto “dei Crocifissi”. Pittura e devozione nel secondo Trecento bolognese, Padua, forthcoming, cat. no. 74a-b. These two panels represent seated figures of Balaam and Isaiah, identified by the texts relating to these prophets, inscribed on the unfurled scroll they hold. Each head is surrounded by a halo of rays, painstakingly incised on the gold ground, especially on the Isaiah. The margins of the panel are not painted or gilded, corresponding with the area of the original frame. The two paintings are connected with two others, similarly representing Zechariah and Solomon. The texts displayed by these four Old Testament figures all relate to the prophecies regarding the coming of Christ and the Virgin as mother of the Saviour. The two panels presented here must have belonged to the upper register of a polyptych similar to the one signed by Simone di Filippo now in the Pinacoteca Nazionale in Bologna (inv. no. 298). The latter came from the church of San Leonardo, and the high quality of its surviving panels conveys its magnitude and prestige. It is likely that in our work, too, the central panel represented a Coronation of the Virgin, given the Marian and Christological references in the scrolls held by the painted Prophets, especially the word “coronaberis” (“you shall be crowned”) on the scroll displayed by Solomon, pertinent to the spouse in the Song of Songs, a prefiguration of the Virgin Mary. It is the monumental structure of the figures and at the same time the expressive nobility of the faces and the highly refined handling of chiaroscuro, that enable us to ascribe these works to Simone di Filippo, precisely in the period of the San Leonardo polyptych and of the two Saints formerly in the collection of Senator Giovanni Gozzadini in Bologna and then in the Spinelli collection in Florence, all datable to the 1380s. 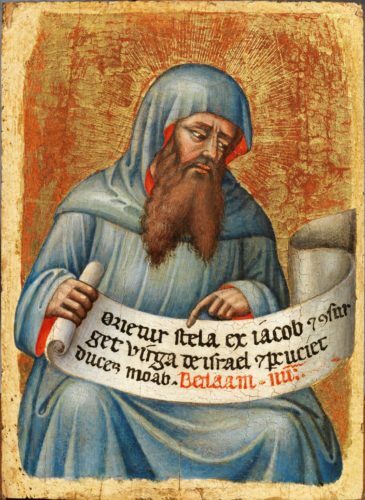 At the start of his career in the mid-1300s, Simone was especially attentive to the ideals of Gothic beauty found in Vitale’s last paintings, and to the vivacious, direct expressiveness of the Maestro dei Polittici Bolognesi and of miniaturists such as the Master of 1346 and the young Nicolò di Giacomo; but he was also open, in an experimental manner, to the spatial and sculptural promptings of Giotto’s art in Bologna, through the works of the painter known as the Pseudo-Dalmasio and the presence of the signed polyptych by Giotto himself, now in the Pinacoteca (inv. no. 284). In the years around 1370, the period of his first dated works – the Pietà of Giovanni Elthinl del 1368, now in the Museo Davia Bargellini (inv. no. 173), and the painted cross in San Giacomo Maggiore of 13706 – these diverse components blend into a uniform and clearly recognisable language, marked by a monumental approach to figures, precious embellishments, sweet and elegant female faces, and highly-charged and stern male ones. This successful formula then formed the heart of Simone’s style, which was destined to dominate Bologna during the last thirty years of the century. Simone can be admired for the sense of communication and engagement with which he conveys devotional and narrative subjects, not to mention an attempt to absorb the more crude and robust neo-Giottesque aspects of Jacopo Avanzi and Jacopo di Paolo. In our panels, Simone conveys the potent sculptural quality of the figures, further evoked by the spatial flow of the scrolls, and the austere expressive energy of the faces, subtly varied according to the characters of the prophets. Yet the artist softens the harsher, more brusque aspects of the latest neo-Giottesque idiom through a mellowness of handling inherited from his training in the circle of Vitale, creating a sequence of images that must have been particularly pleasing, in its tempered renewal of local tradition, to his devout Bolognese audience.